Below Zeta (Alnitak) at the left hand end of Orion's belt lies Sigma. Viewed through a telescope this star is a multiple system looking for all the world like Jupiter and three of its four moons. 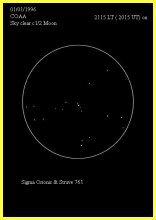 Even better, the triple star system Struve 761 lies very close by, and if you're not using huge magnification should be in the same eyepiece field.